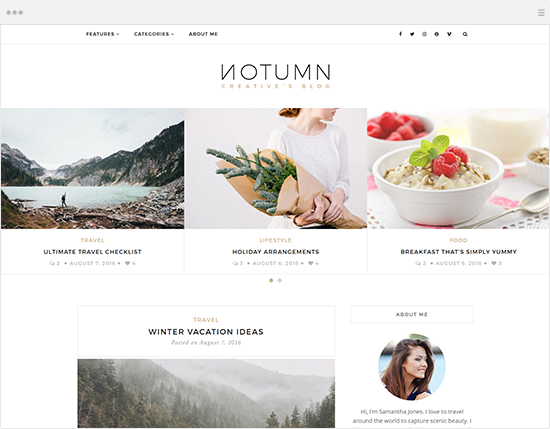 Notumn - A Clean, Elegant & Minimal wordpress theme for creative bloggers. A Clean, Elegant and Minimal Wordpress theme for creatives. It is suitable for personal blog, fashion, photography, travel, food and magazine etc. 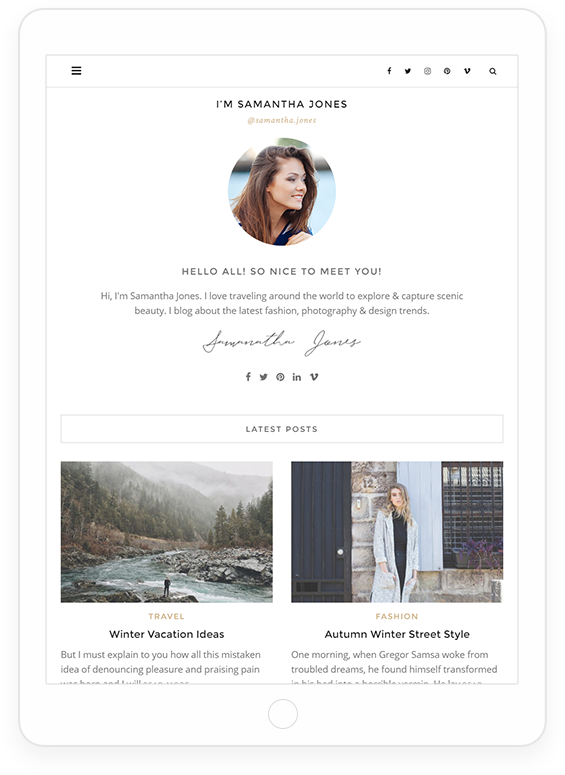 Make your content stand out with clean, clutter free and gorgeous minimalistic layouts of Notumn that look great on any kind of device. 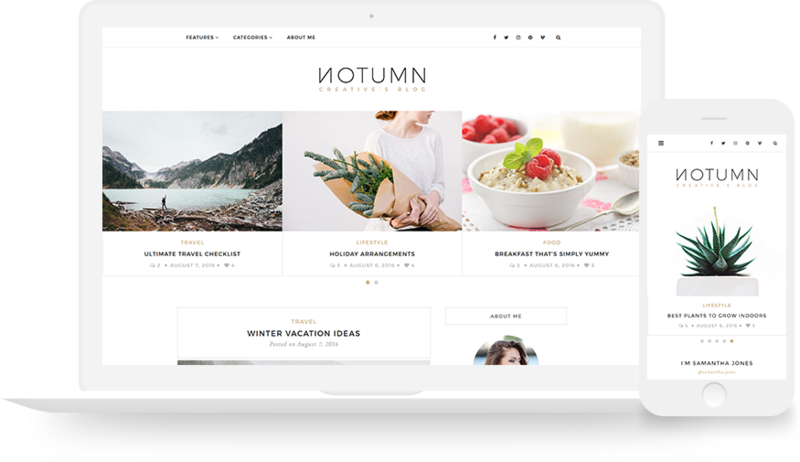 Notumn's Clean, Responsive and Robust Layout enables you to present your content in the most compelling way to any user on any device. Keep your audience engaged and socially connected with Notumn's simple yet powerful features. It is a customizable & flexible theme that allows you to easily customize layouts, header, footer, widgets, typography, colors and almost every aspect of the theme with simple clicks. Resolve any kind of issues with our fast & reliable support. Explore Notumn with our live demos. Notumn is loaded with wide range of useful features to customize the appearance and functionality of the theme to your need. It is built with the new responsive images in mind, our theme is responsive from the core and fully embraces the responsive images to make your content look sharp & crisp on any device. 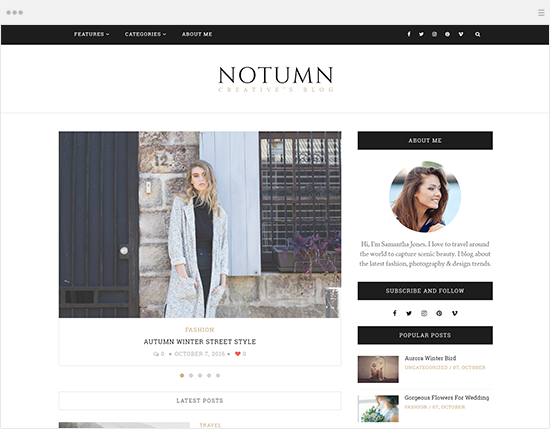 Notumn is responsive from the core and has robust layout that looks & works great on any device. Layout & Featured Image size selectors for every post and page. The theme is optimized to load faster. All images are lazyloaded. We take great responsibility in assisting our customers and we'll respond as quickly as possible.